Celebrate International Craft Month - Egg-ceptional!!!!!! Welcome to March, to my blog and to International Craft Month! To celebrate all of the above, I'm thrilled to be participating in the blog tour from QuiltShopGal. Spring is coming - really truly it is. Temperatures in NC have crept into the 60's and the daffodils are in bloom. To celebrate, I made eggs. And not just any eggs. Egg-ceptional eggs! (Try saying that 3 times fast!) These are so versatile - the possibilities of what you create are just infinite. Enjoy a brief tutorial on each egg and then keep reading to enter the giveaway and see the other bloggers on the International Craft Month celebration tour! Place the two (2) pieces of backing fabric right sides together and sew a 1/4'' seam across the 6'' edge leaving a gap for turning. (Close up photo.) Open and press. The pressing will leave a nice crease at the gap which will make closing the gap later easier. Lay the decorated egg on top of the backing fabric, right side together. Sew around the egg at 1/4''. Trim. Turn inside out through the gap in the backing fabric. Iron flat and (optionally) add decorative stitching around edges. Close gap in backing. This is a great project for scraps since you only use little bits of fabric and ribbons - you'll have a lot of fun making these. You could also consider stuffing them after turning to give the egg a 3 dimensional effect. Trim the excess fabric around fusible. Lay the decorated egg on top of the backing fabric, right side together. Sew around the egg at 1/4''. Trim. Turn inside out through the gap in the backing fabric. Iron flat and (optionally) add decorative stitching around edges. Close gap in backing. I'd LOVE to see photos of any of the eggs you create. If you share via Instagram, please add a #elmstreetquilts and #eggceptional tag! 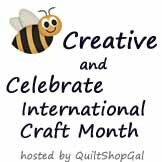 Before you dash off to make your eggs, please go visit the other bloggers in today's celebration of International Craft Month! Thanks, Darelene for being a terrific hostess! I'll also be linking up at Blossom Heart Quilts, Sew Fresh Quilts and Freemotion by the River. A very cut project - I love the embroidery!! Oh cute! I remember teaching egg placemats one year with my kids sewing classes. They were really fun to do. These are so cute and have so many possibilities for fun ways to decorate, thank you! I love easter eggs of any kind. Yours are lovely! Thanks for sharing. Patty, I was looking at your eggs, and thought how about taking two to make a cute 'Egg Zipper Bag'? Wouldn't that be cute to tuck into a basket? I think my mind is there after hearing one dd made a zip bag from 2 old socks the other night! I couldn't laugh--it worked, but took her darn near forever! Tis the month to be creative, and you've gotten me started. Thank you! These are really good projects. Lots of inspiration for eggs here!! These are really cute! Thank you for sharing. Oh, my goodness, how cute are these fabric eggs? How cute! I have several people on my prayer list that would love a 'little something' to cheer them up. I just might have to go make some eggs today. Thanks! Thanks for sharing. Love the project because there is the hope of spring as I watch the snow fall!!! What an #eggceptional post. I absolutely love your eggs and great tutorial. This look like they'd be super fun and fast to stitch and also a great project to "play" with various fancy stitches that come with our machines, but so many of us forget to use. Although I do love your beautiful hand embroidery on yours. Thank you for sharing and help to kick off our Celebration of International Craft Month. I couldn't do this without your help. i love your embroidered egg, very cute idea. Very clever! Hi from another NC gal! LOL that is a great idea. I like the embroidery and I think this might work for part of the crazy quilt fun we are doing! Thanks for sharing this idea. Oh I absolutely love the embroidered one. So cute! Maybe I'll give them a try in a smaller version to hang on out indoor "egg tree"
What fabulous eggs. And thanks for giving two very different options. Cute eggs, you are all ready for Easter. So what did you do with your eggs? These are cute and I like the embroidery. Thanks. Love these fabric eggs, sew cute, sew cool, sew cuddly!! HI,really cute! Thanks for sharing! Fun tutorial on making the eggs. I really like the embroidered version. So cute. I need a few new Easter decorations so this is going on my to do list. I like the embroidery egg. Spring AND a month all about crafting -- sounds like a winner! Those eggs are darling. Can't wait to make a couple. Wonderful idea. I'm off to read your Bargello sew along, sounds great! So cute! Reminds me of a smocked egg I did many years ago. Yay for Spring! Thank you for the template, and the tutorial. Your project looks so sweet with the spring color combinations. I love that fabric egg. It's very clever. Great idea for placemats for Easter! What a great use of quilt as you go! Cute fabric eggs. thanks for the tut. That looks so cute with the bunny next to your eggs. This would be great placemats for young children. Patty, I love both of your eggs; in particular the embroidered egg. Having learned from my mother as a child to embroider dish towels, it's a skill in my long term memory. Recently tested my skills...still there! The egg is next on my agenda. Thank you for sharing and Happy Crafting for the month...and then some. Your fabric eggs are adorable. Those are cute and would be fun to use for mug rugs, or even to make bunting to decorate for Easter. Thank you for the wonderful tutorial. These would make great Easter table decorations! Thanks for sharing. Unique project. I do like the hand embroidery you did. I love your embroidered egg! So pretty! I've also seen similar eggs as potholders. Sweet little memories-in-the-making. Thank you for the tutorial. Thank you my granddaughter will love these. I am ready to make some Fabric Easter Eggs. Beautiful stitching, luv your egg idea. Not sure if I have skills to try. Like your fabric bunny . thanks sew for chance to become lucky winner. A great tutorial! Thank you for sharing. These eggs are adorable! Thanks! Eggs are so cute. Great for a mug rug. Those are cute. I may make some with thermal batting, for hot pads. Thanks. Thanks for the tutorial! And for participating in the blog-hop~ I love finding new blogs! Thanks for participating I the mini blog-hop...it's fun finding new blogs! Yummy eggs. Great tute. Thanks. These are so cute. I'm away from home for a few weeks so I'll have to try this later, but they would be so cute stuffed and put in a small basket. I think this is a brilliant idea! No calories in these Easter eggs, yet the kiddies will have a wonderful time on their Easter Egg hunt! I will be sharing the idea with all my sewing friends. So cute! I want to learn to embroider, so maybe I'll try one! Thanks!! Your eggs-ceptional eggs are exceptional! Had to say that! Your tutorial is great - love the embroidery. Cute! Will try the fabric egg! Hand embroidery makes any project so sweet and personal...love the fabric egg! Now these are the eggs I can handle! I found out a few years ago, that I'm allergic to eggs. So of course, no eating or decorating eggs. These fabric ones are cute! What a cute idea. I definitely need to make several of these. Your embroidery on the eggs was stunning, such a cute idea. Very cute eggs! Thank you for sharing how to make them. This is so cute. I love the embroidery. Great alternative to hiding real eggs! really enjoyed the tutorial and am looking forward to new ones. Love the eggs! What a great idea for a child's placemat as well. Thank you for sharing!